The Global Volcanism Program has no activity reports for Crater Lake. The Global Volcanism Program has no Weekly Reports available for Crater Lake. The Global Volcanism Program has no Bulletin Reports available for Crater Lake. 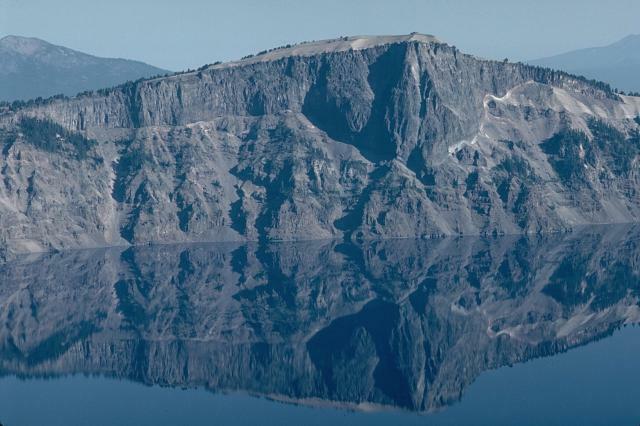 The spectacular 8 x 10 km Crater Lake caldera in the southern Cascades of Oregon formed about 6850 years ago as a result of the collapse of a complex of overlapping shield and stratovolcanoes known as Mount Mazama. The cone-building stage, during which at least five andesitic and dacitic shields and stratovolcanoes were constructed, took place between about 420 and 40 thousand years ago (ka). A series of rhyodacitic lava domes and flows and associated pyroclastic rocks were erupted between about 30 ka and the climactic eruption. The explosive eruptions triggering collapse of the 8-10 km wide caldera about 7500 years ago were among Earth's largest known Holocene eruptions, distributing tephra as far away as Canada and producing pyroclastic flows that traveled 40 km from the volcano. A 5-km-wide ring fracture zone is thought to mark the original collapse diameter. 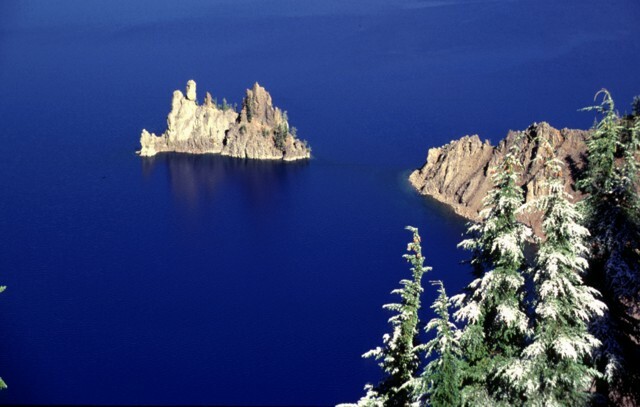 The deep blue waters of North America's second deepest lake, at 600 m, fill the caldera to within 150-600 m of its rim. Post-caldera eruptions within a few hundred years of caldera formation constructed a series of small lava domes on the caldera floor, including the partially subaerial Wizard Island cinder cone, and the completely submerged Merriam Cone. The latest eruptions produced a small rhyodacitic lava dome beneath the lake surface east of Wizard Island about 4200 years ago. Bacon C R, 1983. 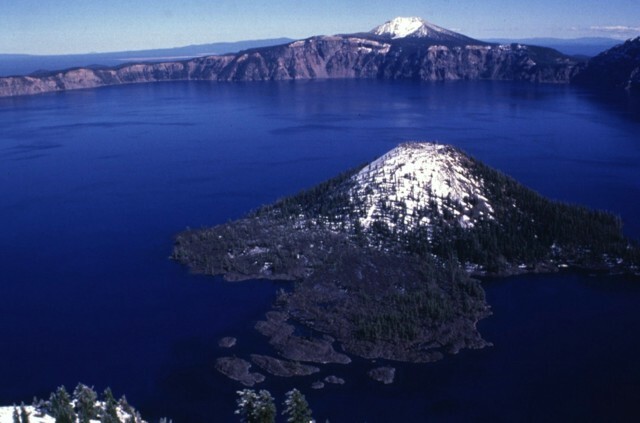 Eruptive history of Mount Mazama and Crater Lake caldera, Cascade Range, U S A. J. Volcanol. Geotherm. Res., 18: 57-116. Bacon C R, 2008. Geologic map of Mount Mazama and Crater Lake caldera, Oregon. U S Geol Surv Sci Invest Map, I-2832, 1:24,000 scale, 4 sheets and 45 p text. Bacon C R, Druitt T H, 1988. Compositional evolution of the zoned calcalkaline magma chamber of Mount Mazama, Crater Lake, Oregon. Contr Mineral Petr, 98: 224-256. Bacon C R, Lanphere M A, 2006. 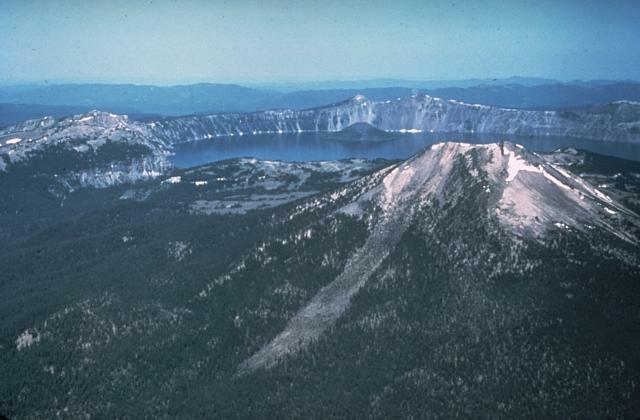 Eruptive history and geochronology of Mount Mazama and the Crater Lake region, Oregon. Geol Soc Amer Bull, 118: 1331-1359. Kamata H, Suzuk-Kamata K, Bacon C R, 1993. 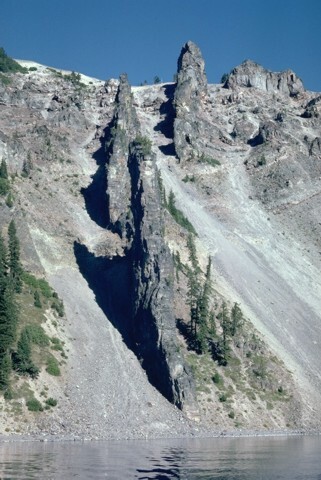 Deformation of the Wineglass Welded Tuff and the timing of caldera collapse at Crater Lake, Oregon. J. Volcanol. Geotherm. Res., 56: 253-266. Nelson C H, Bacon C R, Robinson S W, Adam D P, Bradbury J P, Barber J H Jr, Schwartz D, Vagenas G, 1994. The volcanic, sedimentologic, and paleolimnologic history of the Crater Lake caldera floor, Oregon: evidence for small caldera evolution. Geol Soc Amer Bull, 106: 684-704. Zdanowicz C M, Zielinski G A, Germani M S, 1999. Mount Mazama eruption: calendrical age verified and atmospheric impact assessed. Geology, 27: 621-624. There is no Deformation History data available for Crater Lake. There is no Emissions History data available for Crater Lake. This inconspicuous ridge rising above pastures of the Klamath River valley is actually the rim of Crater Lake caldera, one of the most dramatic features of the Cascade Range. Formation of the caldera about 6850 years ago truncated Mount Mazama, a complex of overlapping stratovolcanoes and shield volcanoes. The southern caldera rim is located above a point between the two larger trees at the left side of the photo. 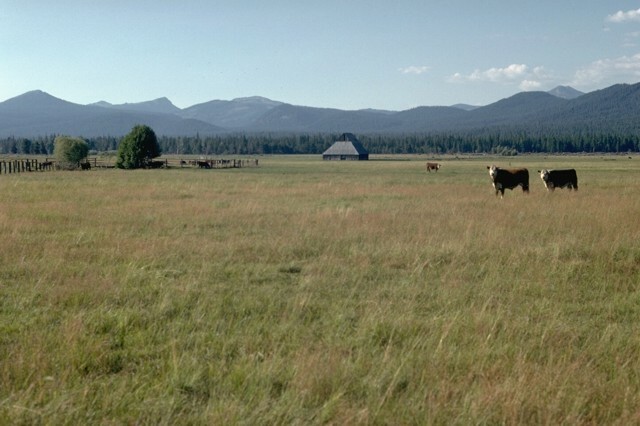 Mount Scott, a pre-caldera stratovolcano located east of the caldera rim, forms the small distant peak at the far right. The lower, smooth north rim and jagged south rim of Crater Lake caldera are seen in the distance from the summit of Mt. Thielson to the north. The caldera was formed about 6850 years ago following one of the world's largest explosive eruptions. The eruption resulted in the collapse of ancestral Mount Mazama, a complex of overlapping shield and stratovolcanoes. 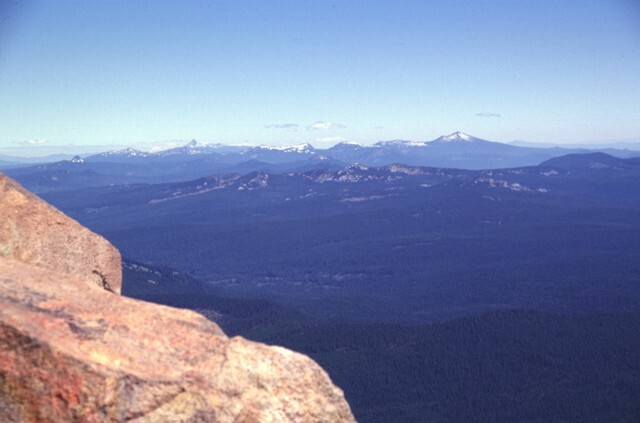 Mount Scott, a pre-caldera stratovolcano, forms the high point on the left skyline, Timber Crater is the symmetrical cone below and left of the north caldera rim. 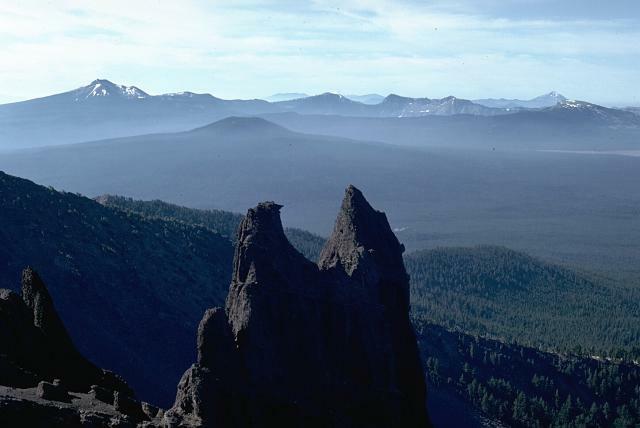 The massive Llao Rock lava flow, truncated in the NW wall of Crater Lake caldera, was emplaced at the end of a major eruption about 150 years prior to the formation of the caldera. The thin, light-colored unit in the caldera wall at the base of the lava flow, seen prominently on the right, is a plinian pumice deposit from that major explosive eruption, one of the largest in the Cascades during the Holocene. The lava flow, more than 350 m thick, is capped by tephra from the caldera-forming eruption of Crater Lake. Devil's Backbone is a spectacular segmented dike that rises nearly 400 m from the shore of Crater Lake to the western rim of the caldera. The andesitic dike was a channel for a vent, now removed by glacial erosion, near Mount Hillman, the westernmost of the complex of overlapping stratovolcanoes forming ancestral Mount Mazama. Pinnacles eroded from a pyroclastic-flow deposit from the caldera-forming eruption of Crater Lake mark former fumarole vents created by degassing of the pyroclastic flow. The rising gases hardened the loose material making these gas-escape routes more resistant to erosion. The change in color of the deposit marks a change in the chemistry of the erupted rocks. The lighter-colored basal rhyodacitic pumice is overlain by gray andesitic scoria. 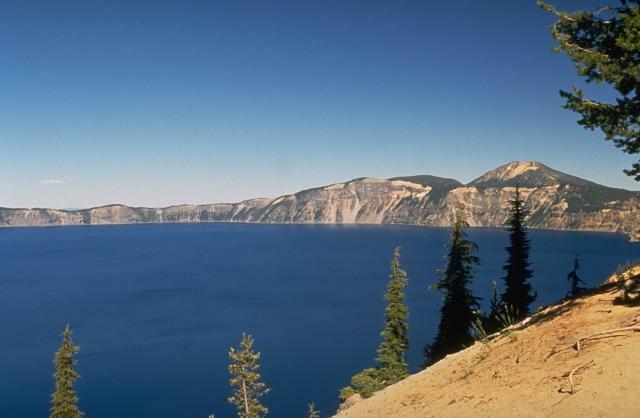 The 8 x 10 km wide Crater Lake caldera, one of the most spectacular features of the Cascade Range, was formed about 6850 years ago during one of the world's largest Holocene eruptions. This eruption resulted in the collapse of ancestral Mount Mazama, a complex of overlapping stratovolcanoes and shield volcanoes. This view from the east shows Mount Scott, one of the pre-caldera stratovolcanoes, in the right foreground. A post-caldera cone, Wizard Island, rises above the far lake surface. Photo by Peter Lipman, 1981 (U.S. Geological Survey). The spectacular 8 x 10 km wide Crater Lake caldera was formed about 6850 years ago when Mount Mazama, a complex of overlapping shield volcanoes and stratovolcanoes, collapsed following a major explosive eruption. The eruption blanketed a huge area with ash falls and produced pyroclastic flows that swept all sides of the volcano. The caldera, seen here from its southern rim, is 1200 m deep and filled to half its depth by the intensely blue waters of Crater Lake. 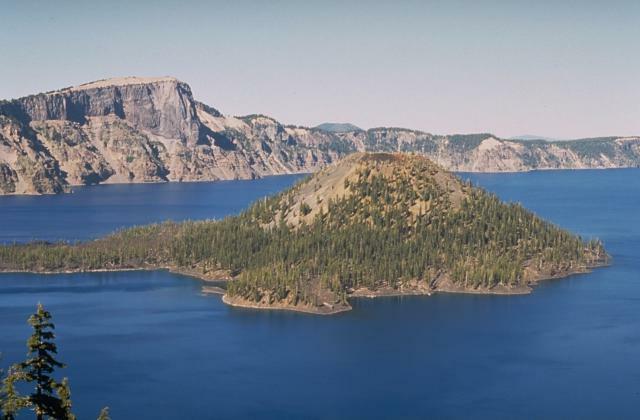 Wizard Island, a post-caldera cone of Crater Lake caldera, erupted some 300 years after formation of the caldera about 6850 years ago. The Wizard Island cinder cones rises over 200 m above the surface of the lake. A lava flow from a vent on its NW flank forms the peninsula at the left. Llao Rock, a massive lava flow erupted about 150 years prior to formation of Crater Lake caldera, forms the prominent peak on the caldera rim. The remarkably deep blue waters of Crater Lake form one of the scenic highlights of the Pacific Northwest. Mid-19th century prospectors, the first European descendants to see the lake, were struck by its intense color and named it Deep Blue Lake. The 600-m-deep lake fills half the height of a caldera that formed during a major eruption about 6850 years ago. 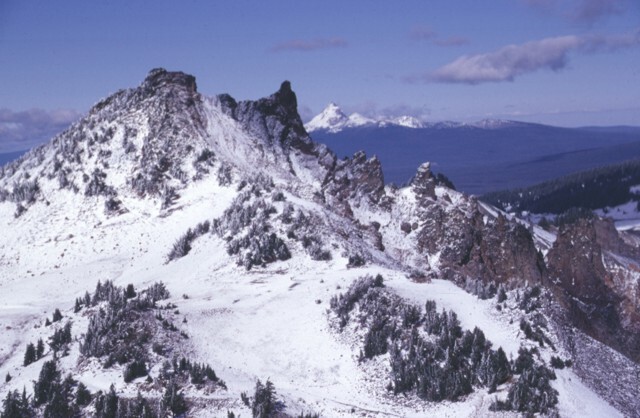 Snow mantles the summit of Wizard Island cinder cone in the foreground and Mount Scott, a pre-caldera stratovolcano beyond the east caldera rim. 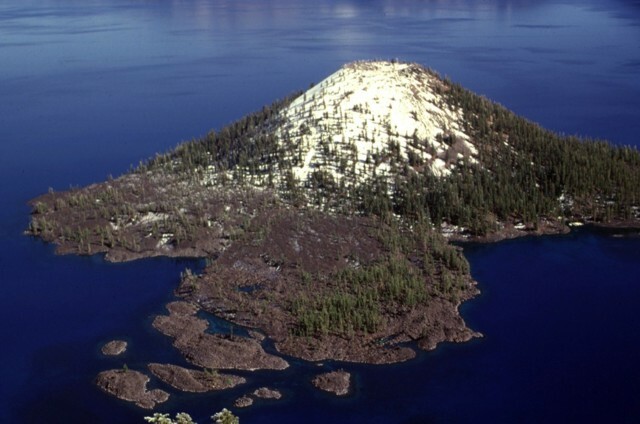 Wizard Island cinder cone, its summit mantled by an early Autumn snowfall, is the most prominent of the post-caldera cones of Crater Lake. Wizard Island grew near the western structural margin of the caldera about 6700 years ago during the final stages of lake filling. The cinder cone and visible lava flows were erupted subaerially; lake waters have risen to cover troughs on the surface of the lava flow forming the peninsula in the foreground on the NW side of the cone. 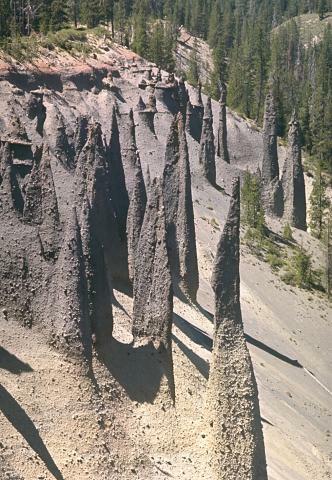 The spires of Phantom Ship, which appears to sail the deep-blue waters of Crater Lake, are eroded remnants of resistant dikes. These dikes were feeders for lavas of Phantom Cone, the oldest of the pre-collapse volcanoes forming Mount Mazama. Phantom Cone lavas have been dated at about 400,000 years before present and are exposed in the SE wall of Crater Lake caldera. Hillman Peak, the westernmost andesitic stratovolcano of Mount Mazama, is partially dissected by Crater Lake caldera. The base of the cone consists of thin andesitic lava flows; these are overlain by bedded pyroclastic-fall deposits. The upper part of the cone, seen here, consists of andesitic lava flows erupted about 67,000 years ago. The snow-capped peak on the center horizon to the north is Mount Thielsen, a Pleistocene volcano north of Crater Lake. The inconspicuous snow-mantled peaks on the northern horizon are the remnants of Mount Mazama, seen here from the summit of Mt. McLoughlin. Mount Mazama, a complex of overlapping stratovolcanoes and shield volcanoes that was once one of Oregon's largest volcanoes, collapsed about 6850 years ago, forming the 8 x 10 km Crater Lake caldera. The highest peak at the right is Mount Scott, part of a pre-caldera volcano east of the caldera rim. The western rim is left of the sharp-peaked Mt. Thielsen, an older volcano north of Crater Lake. 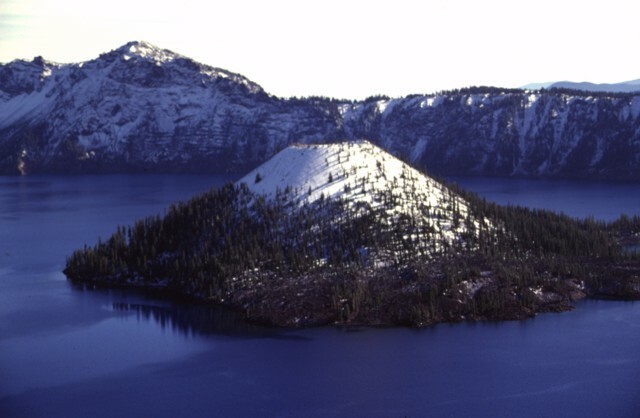 Snow-capped Wizard Island is the only one of three post-caldera cones of Crater Lake caldera that rises above the lake surface. 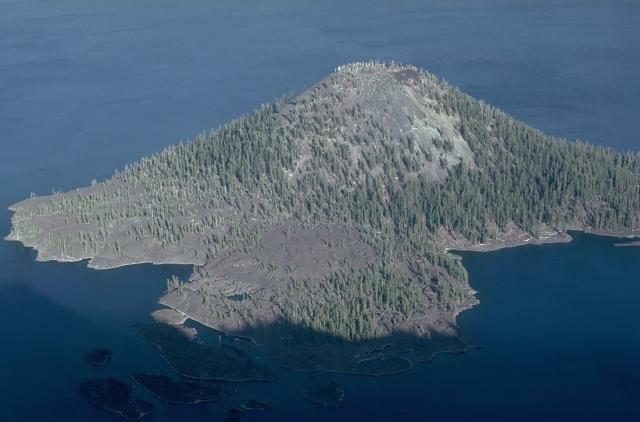 The symmetrical Wizard Island cinder cone, capped by a 90-m-wide summit crater, formed several hundred years after the collapse of Mount Mazama about 6850 years ago. 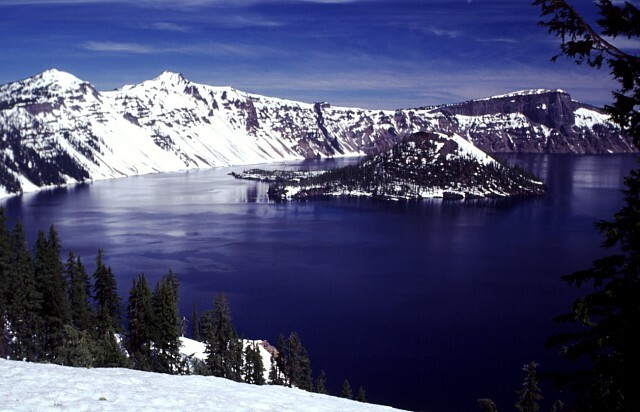 Much of the cone, which was constructed along the western structural margin of the caldera, lies beneath the 600-m-deep waters of Crater Lake. A small dome is located on a sublacustral platform east of Wizard Island. Volcanoes form some of Earth's most spectacular scenery and have been designated as national parks in many countries. The natural landscapes in these parks are a source of visual inspiration and varied recreational opportunities and can also provide economic benefit to surrounding communities. Crater Lake National Park in the Oregon Cascade Range was established in 1902. This image looks across to Wizard Island and the western caldera rim from near the park visitor center and the Crater Lake Lodge. The following 195 samples associated with this volcano can be found in the Smithsonian's NMNH Department of Mineral Sciences collections, and may be availble for research (contact the Rock and Ore Collections Manager). Catalog number links will open a window with more information. Large Eruptions of Crater Lake Information about large Quaternary eruptions (VEI >= 4) is cataloged in the Large Magnitude Explosive Volcanic Eruptions (LaMEVE) database of the Volcano Global Risk Identification and Analysis Project (VOGRIPA).